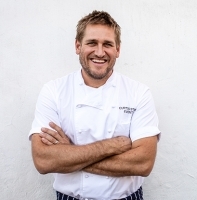 Curtis Stone is a chef, restaurateur, author, media personality, and businessman. He began his cooking career in his homeland of Australia and later honed his skills at Michelin-starred restaurants in London under renowned chef Marco Pierre White. His first solo restaurant, Maude (Beverly Hills, CA), opened in 2014 to rave reviews. Curtis opened his second restaurant, Gwen Butcher Shop & Restaurant (Hollywood, CA), with his brother Luke in July 2016. Curtis’ restaurants have been honored with top accolades including Restaurant of the Year (Eater LA), Best New Restaurant & Best Restaurant (LA Weekly), Most Beautiful Restaurant in the Country (Eater National), while Curtis himself has received awards such as Chef of The Year 2016 (Eater LA - both Editor’s and Reader’s Choice) and the first ever Excellence in the Culinary Arts Award from the Australian Government. With the success of the restaurants and growing demand for customized culinary experiences, Curtis Stone Events was launched in 2017. Designing and tailoring personalized occasions while upholding the standards of Maude and Gwen, this new full-service company aims to raise the bar within the live events industry. Curtis has appeared on a number of top-rated programs including Take Home Chef (TLC), Top Chef Masters (Bravo), and Food Network’s All-Star Academy. Curtis is Head Judge on Emmy-nominated Top Chef Junior, an extension of the NBC Top Chef franchise, alongside host Vanessa Lachey. He hosted his first season of Moveable Feast with Fine Cooking on PBS. Curtis is a New York Times bestselling author with six cookbooks, his most recent titled, Good Food, Good Life, and is a regular contributor to several magazines and television shows in the United States and Australia. In 2016, Curtis began a new pledge to give back: #Commit2One, wherein each year he partners with a charity and devotes the majority of his time and resources to the cause. As part of this initiative, he has raised funds and awareness for The National Young Farmer’s Coalition, Chrysalis, and his current charity, AdoptTogether.